This article is about the plant. For other uses, see Onion (disambiguation). "Onions" redirects here. For the surname, see Onions (surname). Allium cepa var. viviparum – (Metz) Mansf. 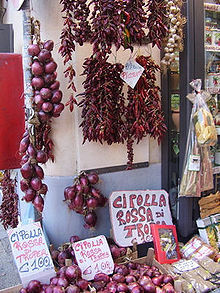 Cepa is commonly accepted as Latin for "onion" and has an affinity with Ancient Greek: κάπια (kápia) and Albanian: qepë and is ancestral to Aromanian: tseapã, Catalan: ceba, Occitan: ceba, Spanish: cebolla, and Romanian: ceapă. The English word chive is also derived from the Old French cive, which derived from cepa. 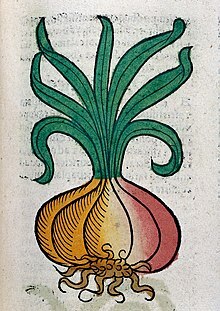 The onion plant has been grown and selectively bred in cultivation for at least 7,000 years. It is a biennial plant, but is usually grown as an annual. Modern varieties typically grow to a height of 15 to 45 cm (6 to 18 in). The leaves are yellowish- to bluish green and grow alternately in a flattened, fan-shaped swathe. They are fleshy, hollow, and cylindrical, with one flattened side. They are at their broadest about a quarter of the way up, beyond which they taper towards a blunt tip. The base of each leaf is a flattened, usually white sheath that grows out of a basal disc. From the underside of the disc, a bundle of fibrous roots extends for a short way into the soil. 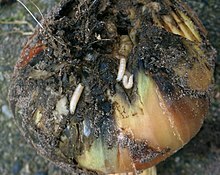 As the onion matures, food reserves begin to accumulate in the leaf bases and the bulb of the onion swells. Because the wild onion is extinct and ancient records of using onions span western and eastern Asia, the geographic origin of the onion is uncertain, with likely domestication worldwide. Food uses of onions date back thousands of years in China, Egypt and Persia. Traces of onions recovered from Bronze Age settlements in China suggest that onions were used as far back as 5000 BCE, not only for their flavour, but the bulb's durability in storage and transport. Ancient Egyptians revered the onion bulb, viewing its spherical shape and concentric rings as symbols of eternal life. Onions were used in Egyptian burials, as evidenced by onion traces found in the eye sockets of Ramesses IV. Common onions are normally available in three colour varieties. Yellow or brown onions (called red in some European countries), are full-flavoured and are the onions of choice for everyday use, with many cultivars bred specifically to demonstrate this sweetness (Vidalia, Walla Walla, Cévennes, "Bermuda," &c.). Yellow onions turn a rich, dark brown when caramelised and give French onion soup its sweet flavour. 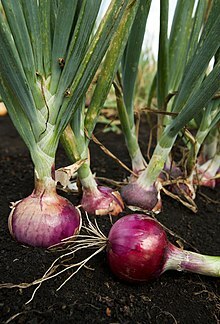 The red onion (called purple in some European countries) is a good choice for fresh use when its colour livens up the dish; it is also used in grilling. White onions are the traditional onions used in classic Mexican cuisine; they have a golden colour when cooked and a particularly sweet flavour when sautéed. The large size of onion cells makes them useful for microscopy. 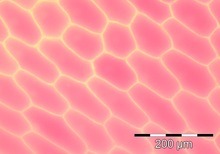 These cells from the epidermis of a red onion are naturally pigmented. Similar to garlic, onions can show an additional colour – pink-red – after cutting, an effect caused by reactions of amino acids with sulfur compounds. Onions have particularly large cells that are readily observed under low magnification. Forming a single layer of cells, the bulb epidermis is easy to separate for educational, experimental, and breeding purposes. 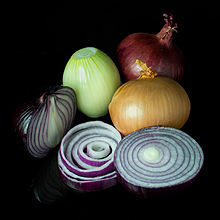 Onions are therefore commonly used in science education to teach the use of a microscope for observing cell structure. Onions are toxic to dogs, cats, guinea pigs, and many other animals. Onion polyphenols are under basic research to determine their possible biological properties in humans. The amount of sulfenic acids and lacrimal factor released and the irritation effect differs among Allium species. In 2008, the New Zealand Institute for Crop and Food Research created "no tears" onions by genetic modification to prevent the synthesis of lachrymatory factor synthase in onions. One study suggests that consumers prefer the flavor of onions with lower LFS content. 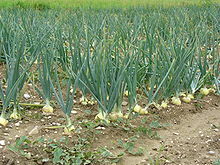 However, since the LFS-silencing process involves reducing sulfur ingestion by the plant, it has also been suggested that LFS− onions are inferior in flavor. A method for efficiently differentiating LFS− and LFS+ onions has been developed based on mass spectrometry, with potential application in high-volume production; gas chromatography is also used to measure lachrymatory factor in onions. In early 2018, Bayer released the first crop yield of commercially-available LFS-silenced onions under the name "Sunions." They were the product of 30 years of cross-breeding; genetic modification was not employed. Guinea hen weed and honey garlic contain a similar lachrymatory factor. Synthetic onion lachrymatory factor has been used in a study related to tear production, and has been proposed as a nonlethal deterrent against thieves and intruders. Onions may be grown from seed or from sets. Onion seeds are short-lived and fresh seeds germinate better. The seeds are sown thinly in shallow drills, thinning the plants in stages. In suitable climates, certain cultivars can be sown in late summer and autumn to overwinter in the ground and produce early crops the following year. Onion sets are produced by sowing seed thickly in early summer in poor soil and the small bulbs produced are harvested in the autumn. These bulbs are planted the following spring and grow into mature bulbs later in the year. Certain cultivars are used for this purpose and these may not have such good storage characteristics as those grown directly from seed. Cooking onions and sweet onions are better stored at room temperature, optimally in a single layer, in mesh bags in a dry, cool, dark, well-ventilated location. In this environment, cooking onions have a shelf life of three to four weeks and sweet onions one to two weeks. Cooking onions will absorb odours from apples and pears. Also, they draw moisture from vegetables with which they are stored which may cause them to decay. The tree onion or Egyptian onion produces bulblets in the umbel instead of flowers, and is now known to be a hybrid of A. cepa and A. fistulosum. It has previously been treated as a variety of A. cepa, for example A. cepa var. proliferum, A. cepa var. bulbiferum, and A. cepa var. viviparum. It has been grown for centuries in Japan and China for use as a salad onion. The Onion Futures Act, passed in 1958, bans the trading of futures contracts on onions in the United States. This prohibition came into force after farmers complained about alleged market manipulation by Sam Siegel and Vincent Kosuga at the Chicago Mercantile Exchange two years earlier. The subsequent investigation provided economists with a unique case study into the effects of futures trading on agricultural prices. The act remains in effect as of 2019[update]. ^ "Allium cepa L.". World Checklist of Selected Plant Families (WCSP). Royal Botanic Gardens, Kew – via The Plant List. ^ Block, E. (2010). Garlic and Other Alliums: The Lore and the Science. Royal Society of Chemistry. ISBN 978-0-85404-190-9. ^ "AllergyNet — Allergy Advisor Find". Allallergy.net. Archived from the original on 15 June 2010. Retrieved 14 April 2010. ^ a b McNeal Jr., Dale W.; Jacobsen, T. D. (2002). "Allium cepa". In Flora of North America Editorial Committee (ed.). Flora of North America North of Mexico (FNA). 26. New York and Oxford – via eFloras.org, Missouri Botanical Garden, St. Louis, MO & Harvard University Herbaria, Cambridge, MA. ^ "Allium cepa var. cepa". Germplasm Resources Information Network (GRIN). Agricultural Research Service (ARS), United States Department of Agriculture (USDA). Retrieved 10 December 2017. ^ a b c Fritsch, R.M. ; Friesen, N. (2002). "Chapter 1: Evolution, Domestication, and Taxonomy". In Rabinowitch, H.D. ; Currah. L. (eds.). Allium Crop Science: Recent Advances. Wallingford, UK: CABI Publishing. pp. 9–10. ISBN 978-0-85199-510-6. ^ Brewster, James L. (1994). Onions and other vegetable Alliums (1st ed.). Wallingford, UK: CAB International. p. 16. ISBN 978-0-85198-753-8. ^ Linnaeus, Carolus (1753). Species Plantarum (in Latin). 1. Stockholm: Laurentii Salvii. p. 262. ^ "Allium cepa". Natural Resources Conservation Service PLANTS Database. USDA. Retrieved 31 March 2013. ^ "Allium cepa L." Integrated Taxonomic Information System. Retrieved 1 April 2013. ^ Grubben, G.J.H. ; Denton, O.A. (2004) Plant Resources of Tropical Africa 2. Vegetables. PROTA Foundation, Wageningen; Backhuys, Leiden; CTA, Wageningen. ^ Zohary, Daniel; Hopf, Maria (2000). Domestication of plants in the Old World (Third ed.). Oxford: Oxford University Press. p. 198. ISBN 978-0-19-850357-6. ^ a b c Fritsch, R.M. ; N. Friesen (2002). "Chapter 1: Evolution, Domestication, and Taxonomy". In H.D. Rabinowitch; L. Currah (eds.). Allium Crop Science: Recent Advances. Wallingford, UK: CABI Publishing. pp. 20–21. ISBN 978-0-85199-510-6. ^ a b c d e Brickell, Christopher, ed. (1992). The Royal Horticultural Society Encyclopedia of Gardening. Dorling Kindersley. p. 345. ISBN 978-0-86318-979-1. ^ "Approximate pH Values of Common Foods and Ingredients" (PDF). Wisconsin Food Safety and Health. Archived from the original (PDF) on 24 December 2012. Retrieved 8 January 2018. ^ a b c d Cumo, CE (2015). Onion. In: Foods that Changed History: How Foods Shaped Civilization from the Ancient World to the Present. ABC-CLIO LLC (American Bibliographic Center, CLIO Press). pp. 248–50. ISBN 9781440835377. ^ a b Ansari NA (2007). "Onion Cultivation and Production in Iran" (PDF). Middle Eastern and Russian Journal of Plant Science and Biotechnology. 1 (2): 26–38. ^ a b c d e f g h i "History of onions". US National Onion Association, Greeley, CO. 2011. Retrieved 23 January 2017. ^ Abdel-Maksouda, Gomaa; El-Aminb, Abdel-Rahman (2011). "A review on the materials used during the mummification process in ancient Egypt" (PDF). Mediterranean Archaeology and Archaeometry. 11 (2): 129–150. ^ Oulton, Randal (9 September 2005). "Bermuda Onions". cooksinfo.com. Retrieved 25 November 2017. ^ Mower, Chris. "The Difference between Yellow, White, and Red Onions". The Cooking Dish. Retrieved 24 March 2013. ^ a b Thompson, Sylvia (1995). "The Kitchen Garden". Bantam Books: 143. ^ Ministry of Agriculture; Fisheries and Food (1968). Home Preservation of Fruit and Vegetables. HMSO. p. 107. ^ Smith, S. E. (2013). "What is onion powder". WiseGeek. Conjecture Corporation. Retrieved 2 April 2013. ^ "Onion". GoodFood. BBC. Retrieved 2 April 2013. ^ Lukes, T. M. (1 November 1986). "Factors Governing the Greening of Garlic Puree". Journal of Food Science. 51 (6): 1577. doi:10.1111/j.1365-2621.1986.tb13869.x. ISSN 1750-3841. ^ Lee, Eun Jin; Rezenom, Yohannes H.; Russell, David H.; Patil, Bhimanagouda S.; Yoo, Kil Sun (1 April 2012). "Elucidation of chemical structures of pink-red pigments responsible for 'pinking' in macerated onion (Allium cepa L.) using HPLC–DAD and tandem mass spectrometry". Food Chemistry. 131 (3): 852–861. doi:10.1016/j.foodchem.2011.09.059. ^ Suslov, D; Verbelen, J. P.; Vissenberg, K (2009). "Onion epidermis as a new model to study the control of growth anisotropy in higher plants". Journal of Experimental Botany. 60 (14): 4175–87. doi:10.1093/jxb/erp251. PMID 19684107. ^ Xu, K; Huang, X; Wu, M; Wang, Y; Chang, Y; Liu, K; Zhang, J; Zhang, Y; Zhang, F; Yi, L; Li, T; Wang, R; Tan, G; Li, C (2014). "A rapid, highly efficient and economical method of Agrobacterium-mediated in planta transient transformation in living onion epidermis". PLoS ONE. 9 (1): e83556. doi:10.1371/journal.pone.0083556. PMC 3885512. PMID 24416168. ^ Anne McCabe; Mick O'Donnell; Rachel Whittaker (19 July 2007). Advances in Language and Education. Bloomsbury Publishing. p. 35. ISBN 978-1-4411-0458-8. ^ Cope, R.B. (August 2005). "Allium species poisoning in dogs and cats" (PDF). Veterinary Medicine. 100 (8): 562–566. ISSN 8750-7943. ^ Salgado, B.S. ; Monteiro, L.N. ; Rocha, N.S. (2011). "Allium species poisoning in dogs and cats". Journal of Venomous Animals and Toxins Including Tropical Diseases. 17 (1): 4–11. doi:10.1590/S1678-91992011000100002. ISSN 1678-9199. ^ a b c d Slimestad, R; Fossen, T; Vågen, I. M. (2007). "Onions: A source of unique dietary flavonoids". Journal of Agricultural and Food Chemistry. 55 (25): 10067–80. doi:10.1021/jf0712503. PMID 17997520. ^ Olsson, M.E. ; Gustavsson, K.E. & Vågen, I.M. (2010). "Quercetin and isorhamnetin in sweet and red cultivars of onion (Allium cepa L.) at harvest, after field curing, heat treatment, and storage". Journal of Agricultural and Food Chemistry. 58 (4): 2323–2330. doi:10.1021/jf9027014. PMID 20099844. ^ Cantisani, C; Visconti, B; Paolino, G; Frascani, F; Tofani, S; Fazia, G; Calvieri, S (2014). "Unusual food allergy: Alioidea allergic reactions overview". Recent Patents on Inflammation & Allergy Drug Discovery. 8 (3): 178–84. PMID 25381903. ^ Arochena, L.; Gámez, C.; del Pozo, V.; Fernández-Nieto, M. (2012). "Cutaneous allergy at the supermarket". Journal of Investigational Allergology and Clinical Immunology. 22 (6): 441–442. PMID 23101191. ^ a b Scott, Thomas. "What is the chemical process that causes my eyes to tear when I peel an onion?". Ask the Experts: Chemistry. Scientific American. Retrieved 28 April 2007. ^ a b "FAQ". National Onion Association. Retrieved 28 March 2013. ^ Hiskey, Daven (5 November 2010). "Why onions make your eyes water". Today I Found Out. Retrieved 28 March 2013. ^ "Tearless Onion Created In Lab Using Gene Silencing". ScienceDaily. 5 February 2008. Retrieved 23 November 2016. ^ Kim, Ha-Yeon; Jackson, Daniel; Adhikari, Koushik; Riner, Cliff; Sanchez-Brambila, Gabriela (1 October 2017). "Relationship Between Consumer Acceptability and Pungency-Related Flavor Compounds of Vidalia Onions". Journal of Food Science. 82 (10): 2396–2402. doi:10.1111/1750-3841.13915. ISSN 1750-3841. PMID 28898424. ^ Eady, Colin C.; Kamoi, Takahiro; Kato, Masahiro; Porter, Noel G.; Davis, Sheree; Shaw, Martin; Kamoi, Akiko; Imai, Shinsuke (1 August 2008). "Silencing Onion Lachrymatory Factor Synthase Causes a Significant Change in the Sulfur Secondary Metabolite Profile". Plant Physiology. 147 (4): 2096–2106. doi:10.1104/pp.108.123273. ISSN 0032-0889. PMC 2492635. PMID 18583530. ^ Joyce, Nigel I.; Eady, Colin C.; Silcock, Patrick; Perry, Nigel B.; van Klink, John W. (January 2013). "Fast Phenotyping of LFS-Silenced (Tearless) Onions by Desorption Electrospray Ionization Mass Spectrometry (DESI-MS)". Journal of Agricultural and Food Chemistry. 61 (7): 1449–1456. doi:10.1021/jf304444s. PMID 23350988. ^ Tewari, Gyanendra M.; Bandyopadhyay, Chiranjib. (1 July 1975). "Quantitative evaluation of lachrymatory factor in onion by thin-layer chromatography". Journal of Agricultural and Food Chemistry. 23 (4): 645–647. doi:10.1021/jf60200a044. ISSN 0021-8561. ^ Schmidt, Norman E.; Santiago, Leanne M.; Eason, H. Donald; Dafford, Kurtus A.; Grooms, Chris A.; Link, Tammy E.; Manning, Dana T.; Cooper, Sylina D.; Keith, R. Chad (1 January 1996). "Rapid Extraction Method of Quantitating the Lachrymatory Factor of Onion Using Gas Chromatography". Journal of Agricultural and Food Chemistry. 44 (9): 2690–2693. doi:10.1021/jf950686s. ISSN 0021-8561. ^ a b Danovich, Tove (8 February 2018). "Stop Crying! Tear-Free Onions Are Here". National Public Radio. Retrieved 13 April 2018. ^ Van Hare, Holly (19 December 2017). "Onions that don't make you cry are finally here". LA Times. Retrieved 15 April 2018. ^ Klein, Joanna (5 September 2017). "Why Onions Make You Cry". The New York Times. Retrieved 16 April 2018. ^ Savonen, Carol (13 July 2006). "Onion bulb formation is strongly linked with day length". Oregon State University Extension Service. Retrieved 14 September 2013. ^ a b c "Onions: Planting, Growing and Harvesting Onion Plants". The Old Farmer's Almanac. Retrieved 27 March 2013. ^ Rhoades, Jackie. "What is Onion Bolting and how to Keep an Onion from Bolting". Gardening Know How. Retrieved 27 March 2013. ^ "Onion production". USDA: Agricultural Research Service. 23 February 2011. Retrieved 27 March 2013. ^ "Onion". Plants for a Future. Retrieved 22 March 2013. ^ Hessayon, D.G. (1978). Be your own Vegetable Doctor. Pan Britannica Industries. pp. 22–23. ISBN 978-0-903505-08-6. ^ Landry, Jean-François (2007). "Taxonomic review of the leek moth genus Acrolepiopsis (Lepidoptera: Acrolepiidae) in North America". The Canadian Entomologist. 139 (3): 319–353. doi:10.4039/n06-098. ^ "Delia antiqua (Meigen): Onion Fly". Interactive Agricultural Ecological Atlas of Russia and Neighboring Countries. Retrieved 29 March 2013. ^ "Onion Eelworm (Ditylenchus dipsaci)". GardenAction. 2011. Retrieved 29 March 2013. ^ "Onion white rot". RHS Gardening. Royal Horticultural Society. Retrieved 29 March 2013. ^ "Onion neck rot". RHS Gardening. Royal Horticultural Society. Retrieved 29 March 2013. ^ Jauron, Richard (27 July 2009). "Harvesting and storing onions". Iowa State University Extension. Retrieved 28 March 2013. ^ Brewster, James L. (1994). Onions and other vegetable Alliums (1st ed.). Wallingford, UK: CAB International. p. 5. ISBN 978-0-85198-753-8. ^ "I'Itoi Onion". Ark of Taste. Slow Food USA. 2010. Retrieved 25 March 2013. ^ "Allium × proliferum". Germplasm Resources Information Network (GRIN). Agricultural Research Service (ARS), United States Department of Agriculture (USDA). Retrieved 21 February 2011. ^ a b Fritsch, R.M. ; N. Friesen (2002). "Chapter 1: Evolution, Domestication, and Taxonomy". In H.D. Rabinowitch; L. Currah (eds.). Allium Crop Science: Recent Advances. Wallingford, UK: CABI Publishing. p. 19. ISBN 978-0-85199-510-6. ^ Brewster, James L. (1994). Onions and other vegetable Alliums (1st ed.). Wallingford, UK: CAB International. p. 15. ISBN 978-0-85198-753-8. ^ Brewster, James L. (1994). Onions and other vegetable alliums (1st ed.). Wallingford, UK: CAB International. p. 3. ISBN 978-0-85198-753-8. ^ a b "Onion (dry) production in 2016: Crops/World Regions/Production Quantity from pick lists". Food and Agriculture Organization, Statistics Division (FAOSTAT). 2017. Retrieved 16 April 2018. ^ "7 USC § 13–1 – Violations, prohibition against dealings in motion picture box office receipts or onion futures; punishment". United States Code: 7 USC § 13–1. Legal Information Institute. 1958. Retrieved 24 March 2013. 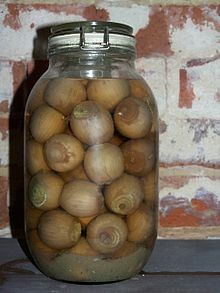 Look up onion in Wiktionary, the free dictionary.